Maybe you haven’t heard of the Defpush.com site. But when you browse the Internet, a large number of notifications from Defpush.com are shown. And these unwanted pop up notifications can appear again and again, even you close them. Then most probably that an adware (sometimes called ‘ad-supported’ software) was installed on your PC. The adware can replace computer setting in order to launch automatically when the PC system start. You will be annoyed about it. Similar to other undesired software, the ‘ad supported’ software can show notifications and advertisements without your permission, and these unwanted ads is difficult to shut down. Even worse, the Defpush.com site has the ability to collect lots of your privacy data to get profit. While your computer is infected with the ‘ad supported’ software, the Google Chrome, Microsoft Edge, Microsoft Internet Explorer and Mozilla Firefox may be redirected to Defpush.com annoying web page. Of course, the ad-supported software may not cause damages to your files or Windows system, but it may show tons of intrusive ads. These advertisements will be injected within the content of websites that are you opening in your internet browser and can be varied: pop-up ads, in-text ads, different sized banners, offers to install an questionable software. The ads will appear on all web pages, including webpages where previously you have never seen any ads. Therefore, the adware is a potentially undesired program and should not be used. If you noticed any of the symptoms mentioned above, we suggest you to perform step-by-step guide below to remove the adware and delete Defpush.com pop up notifications from your web browser. There are a few solutions that can be used to get rid of Defpush.com notifications. But, not all PUPs such as this ad-supported software can be completely uninstalled using only manual methods. Most often you are not able to uninstall any adware utilizing standard MS Windows options. In order to remove Defpush.com notifications you need complete a few manual steps and run reliable removal utilities. Most IT security professionals states that Zemana Free, MalwareBytes Anti-Malware or HitmanPro utilities are a right choice. These free programs are able to find and get rid of adware from your PC and revert back your web-browser settings to defaults. Read this “How to remove” section to know how to manually remove adware responsible for Defpush.com notifications. Even if the step-by-step guide does not work for you, there are several free malware removers below that can easily handle such adware that causes lots of undesired Defpush.com notifications. First method for manual ad supported software removal is to go into the MS Windows “Control Panel”, then “Uninstall a program” console. Take a look at the list of software on your PC system and see if there are any suspicious and unknown apps. If you see any, you need to delete them. Of course, before doing so, you can do an Net search to find details on the application. If it is a potentially unwanted program, adware or malware, you will likely find information that says so. Make sure you have closed all internet browsers and other programs. Look around the entire list of programs installed on your PC system. Most likely, one of them is the adware that causes web-browsers to display annoying popup advertisements. Select the suspicious application or the application that name is not familiar to you and remove it. 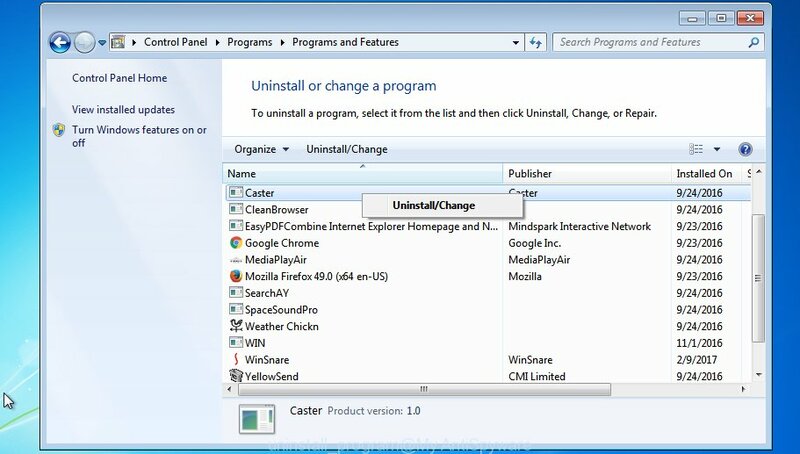 Choose the suspicious or any unknown apps, then click “Uninstall/Change” button to delete this unwanted program from your computer. 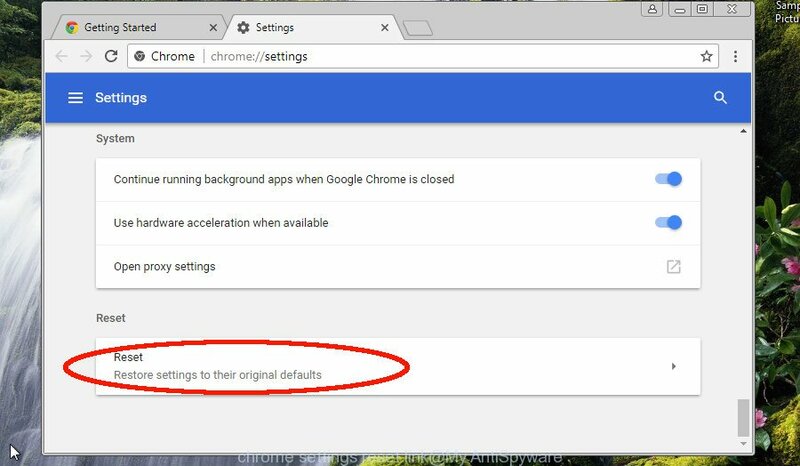 Reset Chrome settings is a simple way to remove the adware, malicious and adware extensions, as well as to recover the internet browser’s newtab page, search provider by default and start page that have been changed by adware. 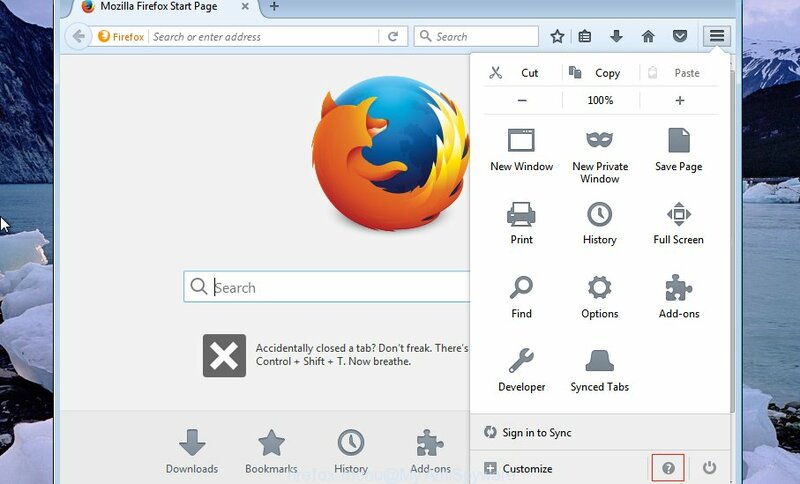 If the Mozilla Firefox web browser is rerouted to unwanted web-sites and you want to recover the Firefox settings back to their original state, then you should follow the steps below. When using the reset feature, your personal information such as passwords, bookmarks, browsing history and web form auto-fill data will be saved. Follow the onscreen procedure to revert back your Firefox browser settings to their original state. If your machine is still infected with ad-supported software, then the best way of detection and removal is to run an antimalware scan on the PC. Download free malware removal utilities below and launch a full system scan. It will help you get rid of all components of the ad supported software from hardisk and Windows registry. You can remove adware automatically with a help of Zemana Anti-malware. We advise this malicious software removal tool because it may easily remove browser hijacker infections, potentially unwanted software, ad supported software with all their components such as folders, files and registry entries. Visit the page linked below to download the latest version of Zemana Free for Microsoft Windows. Save it on your MS Windows desktop. Once downloading is complete, launch it and follow the prompts. 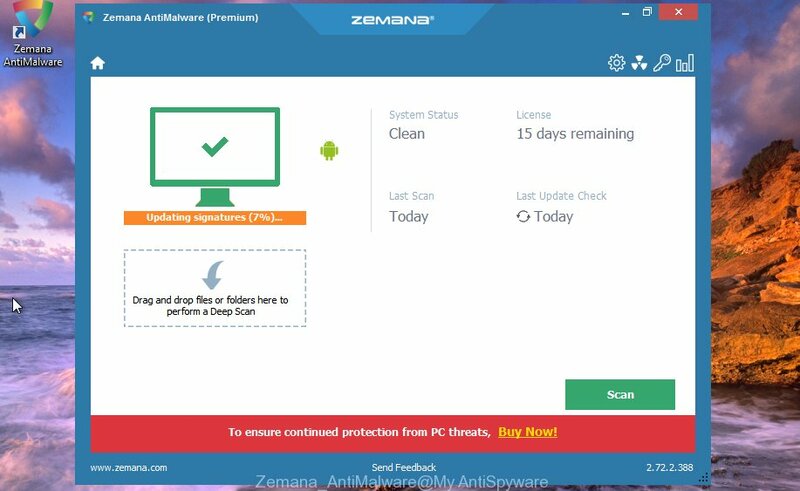 Once installed, the Zemana Anti-Malware (ZAM) will try to update itself and when this task is finished, press the “Scan” button to begin scanning your PC system for the ad supported software. 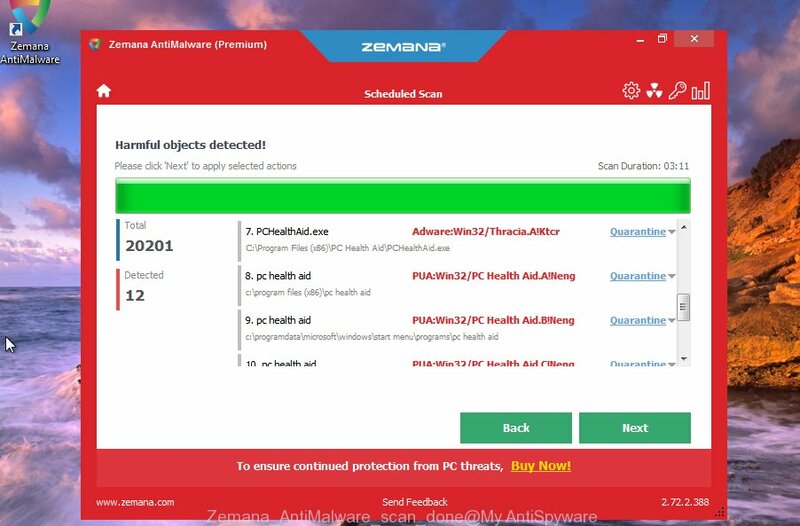 While the Zemana Anti-Malware (ZAM) tool is scanning, you can see count of objects it has identified as being infected by malware. Once you have selected what you want to remove from your PC press “Next” button. The Zemana AntiMalware will delete adware which causes annoying advertisements and move threats to the program’s quarantine. It is also critical to protect your browsers from malicious sites and advertisements by using an ad blocker program like AdGuard. Security experts says that it will greatly reduce the risk of malware, and potentially save lots of money. Additionally, the AdGuard can also protect your privacy by blocking almost all trackers. When the download is done, start the downloaded file. You will see the “Setup Wizard” screen as shown on the screen below. Follow the prompts. After the installation is complete, you will see a window like below. 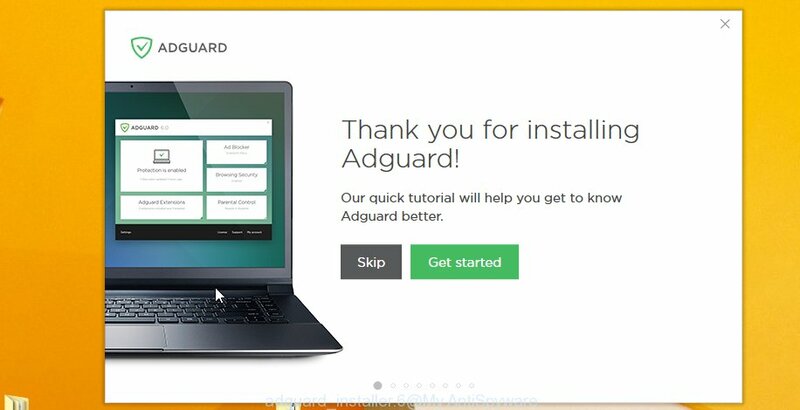 You can click “Skip” to close the install application and use the default settings, or press “Get Started” button to see an quick tutorial that will help you get to know AdGuard better. In most cases, the default settings are enough and you don’t need to change anything. 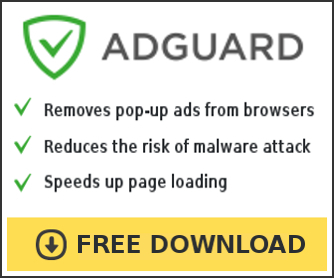 Each time, when you run your system, AdGuard will launch automatically and block pop-up ads, as well as other malicious or misleading web-pages. For an overview of all the features of the program, or to change its settings you can simply double-click on the AdGuard icon, which is located on your desktop. These days some free applications developers bundle third-party apps which could be PUPs such as this ad-supported software, with a view to making some money. These are not free applications as install an unwanted programs on to your MS Windows computer. So whenever you install a new free program that downloaded from the World Wide Web, be very careful during installation. 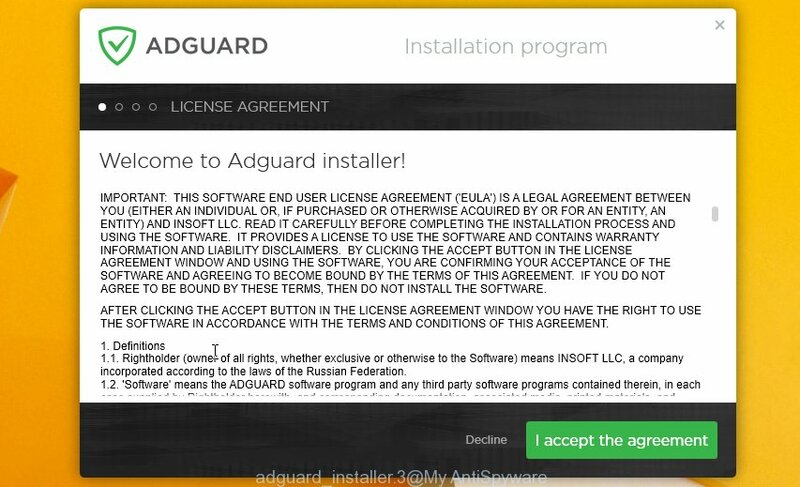 Carefully read the EULA (a text with I ACCEPT/I DECLINE button), select custom or manual installation type, uncheck all bundled apps. Now your computer should be clean of the adware responsible for redirections to unwanted seb-sites. We suggest that you keep AdGuard (to help you stop unwanted pop-up ads and undesired malicious websites) and Zemana Anti-Malware (ZAM) (to periodically scan your system for new malicious software, browser hijackers and ad supported software). Make sure that you have all the Critical Updates recommended for Windows operating system. Without regular updates you WILL NOT be protected when new browser hijackers, malicious applications and ‘ad supported’ software are released. If you are still having problems while trying to remove Defpush.com notifications from your browser, then ask for help in our Spyware/Malware removal forum.